Located on more than 40 acres covered with pine and oak trees, Whispering Pines Campground is one of Southwest Wisconsin’s most scenic campgrounds. Come enjoy the recreation center, playgrounds, swimming pond, Cabana Beach House, and many other conveniences. 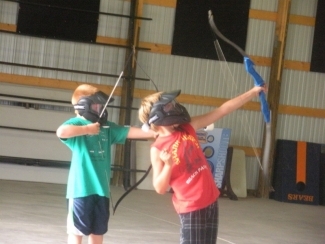 There are many events planned throughout the season for the enjoyment of our campers. View our calendar of events for a full list of activities. Whispering Pines prides itself on being a family friendly campground and hosts a variety of themed weekends and children's activities to keep the kids entertained and let the parents relax! Welcome to Whispering Pines Campground! One of Southwest Wisconsin’s Most Beautiful Campgrounds! Located off of US Highway 53 in Holmen, WI on more than 50 acres covered with pine and oak trees, Whispering Pines Campground is one of Southwest Wisconsin’s most scenic campgrounds. We feature over 195 camp sites all with water and electricity. You’ll enjoy the wooded walking and hiking trails on the Great River Bike Trail, as well as our recreation center, new playground, swimming pond, Cabana Beach House, and many other conveniences. Our main goal is to provide one of the best family campgrounds in the La Crosse area! Our convenient location makes our campground easily accessible! We are located off Hwy. 53, just minutes from Galesville, Onalaska and La Crosse. See more Pictures in the Gallery!